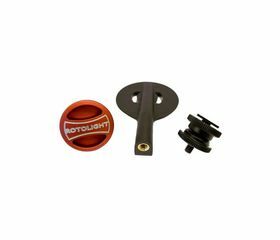 The Rotolight Stand is a compact and lightweight system that offers versatility and rock steady support for the Rotolight RL48-B Ringlight. The Rotolight Stand is rapidly deployable and features a quick release system. The Stand features a 1/4″ tripod screw and can be directly attached to tripods, lighting stands, rail systems or to an accessory shoe (Using the supplied adaptor). The stand is ideal for HD Cinematography, ENG or DSLR Photography and is fully compatible with Rotolight RL48, RL48-A/ RL48-B.